Twixt is a classic connection game designed by Alex Randolf. It's somewhat similar to Hex, but played on a square grid with all connections made by knight's moves. 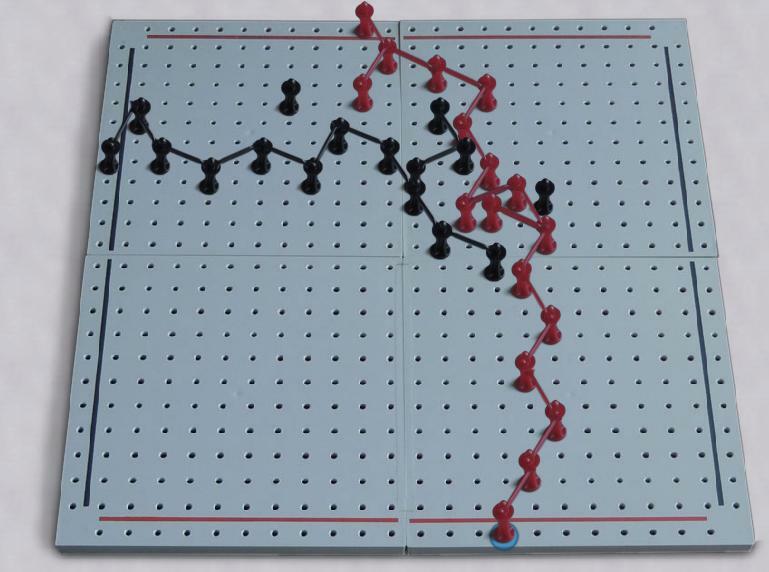 The rules are almost trivial: just connect the opposite sides of the board with a chain of bridges. The amazing and infuriating thing about twixt is that direct strategies to connect do not work, so you are forced to consider indirect methods, which do not obviously lead anywhere. A lot more people have heard of Twixt than have ever played it, which is too bad, because it's a really interesting game! Robots: Alas, the robot player for Twixt is pretty dumb. The back story: Twixt has been on my radar since the beginning, but recent activity which may foretell a new version for sale has revived my interest.